I decided to make a Valentine's card that wasn't pink or red! This one has a nice vintage feel to it. It was fairly quick to make. I put a square of cream textured handmade paper on the base of the card, on top of that I added a square of cream card and stamped a frame on it in brown ink. On a square of brown paper I repeat stamped the text 'lifetime of love' using peach ink. 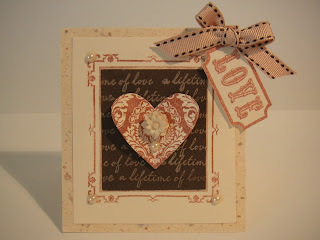 On a separate piece of cream card I stamped the damask heart three times in brown ink. I cut these hearts out and scored a line down the centre of each and folded in half, the back of each half was glued to the next. I added these components together and pierced a hole in the centre of the card to add the cream heart embellishment (vintage earring). 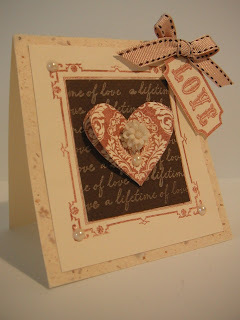 Finally I stamped the LOVE text in brown ink onto a piece of card and cut it out. This was then glued to a piece of ribbon and attached to card, I added a bow and some flat backed pearls to finish. Studio G Clear stamps A Lifetime of love, LOVE, Anna Griffin In the Garden stamps, damask heart.